I made these for my Granddaughter to give to her Daddy. Happy Birthday Merv! The cupcakes were made using a basic cupcake mix along with a basic buttercream mix, before topping buttercream and fondant shapes. Spoon the mixture into the cake cases, filling them to about two-thirds full. Bake for about 25 minutes or until slightly raised and golden brown. Once removed from the oven leave in the tin for 5-10 minutes before transferring to a wire rack to cool completely. In a bowl beat the butter, milk, vanilla extract and half the icing sugar until smooth. Gradually add the remainder of the icing sugar and beat again until the buttercream is smooth and creamy. For the above cupcakes I only used half of the buttercream ingredients. To decorate I first spread the buttercream over each cupcake, before adding cut out ready to roll fondant circles of different colours. 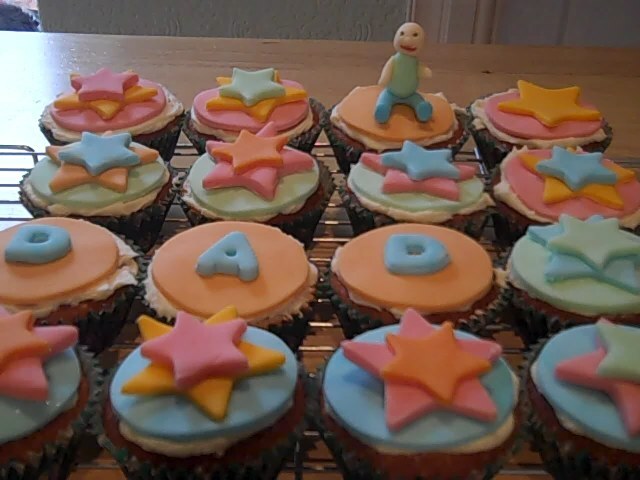 I then added the fondant stars and letters. I then made the little fondant man by rolling a small piece of fondant into a U shape. Attach a small piece of fondant the end of each leg for the shoes. Make a small sausage shape to use for the arms and a tiny piece of fondant for a nose. Roll a piece of fondant into a ball then shape it into a body to add to the closed end of the U, roll a smaller piece of fondant to use as the head (luckily my Son-in-Law is bald so I didn’t have to worry about making hair :-))). I used a cocktail stick to make indentations for the eyes then using a tiny paint brush coloured the indentations using writing icing, I then used a small lid and at an angle pressed it onto the face to make the smile, then coloured the mouth in the same way as the eyes.